Have you planned your Superbowl menu yet?I thought it would be fun to create another recipe in honor of the Seahawks going to the big game. Again. Last year, I posted an original recipe for Seahawk Sliders, a grilled salmon slider, complete with Sriracha mayo and my history with the Seahawks 🙂 . It was the hit of our party! 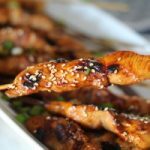 We loved the Sriracha sauce so much, I decided to incorporate it into this dish as well.This year, I’m sharing a recipe for a super simple chicken skewer. They are best when marinated for 24 hours, and then grilled on the bbq or on the stove. It takes less than 5 minutes to cook, then drizzle with some extra sauce, garnish and serve.So simple and so very tasty. I’m predicting this will be our favorite appetizer at this year’s Superbowl party.You know what I’m going to say now. Say it. For all of my Seattle family and friend fans. Mix all marinade ingredients together in a bowl with whisk. Remove 1 cup of sauce from bowl, set aside in a small bowl, cover and refrigerate. Slice the chicken into one inch wide strips. If the breast meat is thick, you may slice the breast in half, then slice again the opposite way in long thin strips. The strips should be about 1" wide by 4-6 inches long, and about 1/2 inch thick. Place the remaining sauce (that has not been saved for serving) in a Ziplock bag or a shallow pan with the chicken. Seal and refrigerate at least 6 hours, and up to 24 hours. Move the chicken around a couple of times during marinating to insure all pieces are covered with sauce. When ready to cook, discard sauce that was used to marinate chicken. Thread the chicken onto the wood skewers and place on a baking sheet or a 9x13 pan. Place the remaining reserved sauce in a small saucepan and heat for about 5 minutes over medium heat or until reduced and thickened a bit. Turn off heat. Chop the green onion for garnish. Heat a griddle or barbecue and grease lightly. Cook the chicken for about 2 minutes on each side at about 400 degrees, or until cooked through. Do not overcook, or the meat will dry out very quickly. Place the cooked meat onto a tray. Drizzle with reduced sauce, sprinkle with sesame seeds and garnish with chopped green onions. Serve immediately, or keep warm by covering with foil. Or refrigerate and serve cold. Do not garnish until ready to serve. -* I used boneless chicken breasts, boneless thigh pieces are also delicious.-Before heating the sauce to drizzle on top of the chicken, I add about 1-2 tablespoons balsamic vinegar for color and flavor. I like the way it adds a little more intense flavor to the sauce.-If you would like to make this dish ahead, it's easy to do so!Marinate the chicken. Follow directions for cooking. When the chicken is cooked, carefully place the skewers in a 9x13 pan and refrigerate.When ready to serve, remove from refrigerator, let sit on counter for about 30 minutes. If serving warm, heat oven to 375 degrees. Heat uncovered on a cookie sheet in a single layer for about 3-5 minutes. Remove, and drizzle with sauce, garnish with sesame seeds and green onions and serve. Grilled this chicken in my charcoal Webber grill. Taste was amazing everyone loved it! Valvette, I’m glad you loved this recipe! I used to have a charcoal Webber too. Loved it. Thanks for reading ABK!